On February 27th 2017, the construction of a new maritime laboratory has started in Ostend. Ghent University, the Catholic University of Leuven and Flanders Hydraulics Research will use this infrastructure to study the impact of waves, tides and wind on ships and constructions at sea. Along with the two universities, Flanders invests 28 million euro in the new Flanders Maritime Laboratory that is planned to be operational in 2020. Flanders Maritime Laboratory is being built on the Plassendale 1 grounds at Greenbridge Research Campus, in the inner harbour of Ostend. This creates a boost for the Ostend harbour and offers opportunities to other companies to further develop in this sector. Flanders Maritime Laboratory is a 2-in-1 complex that houses a big towing tank and a wave tank. At Flanders Hydraulics Research in Antwerp, the accessibility of the Flemish sea harbours is being studied by using ship maneuvering simulators. The towing tank at Flanders Hydraulics Research dates from 1992 and was built to test ships up to 200 meters in length. Today, there are ships up to 400 meters in length that pass through our harbours, so the scale models used in these experiments increase as well. The new towing tank is 174 meters long, 20 meters wide and is filled with 1 meter of water. This allows for maneuvering tests with scale models up to 8 meters in length, twice as long as the current installation in Antwerp, making the test results a lot more accurate. The “Coastal and Ocean wave Basin”, is a large concrete construction filled with water (30 m x 30 m x 1,4 m deep) in which waves, currents and wind can be generated in a controlled manner. 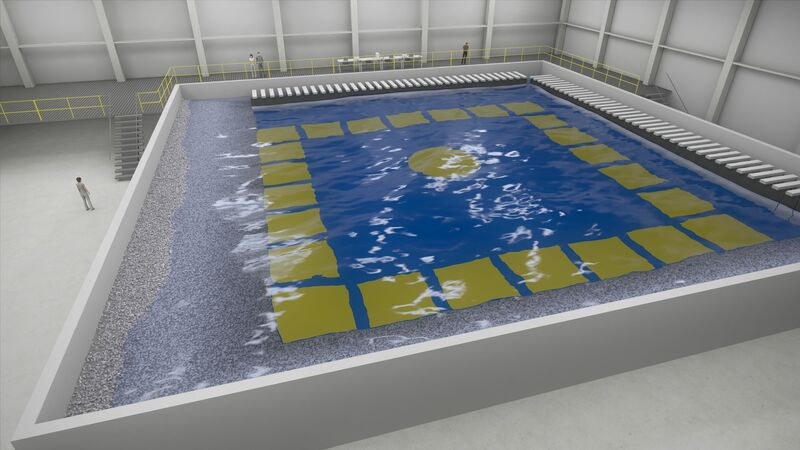 Scale models of offshore constructions, constructions for coastal protection, floating wind turbines, wave energy converters,… are placed in this wave basin (or wave tank) and their design and behaviour under the influence of waves, currents and wind is studied. The first experiments are planned to start in 2020. This new maritime research centre will join the Flemish maritime expertise and strengthen and support the operation of the Belgian ports and shipping. Most importantly, these facilities will strengthen the international research position of Flanders in the field of coastal engineering and offshore engineering. Moreover, the infrastructure provides the opportunity for companies and governmental institutions and agencies to develop innovative designs for coastal protection and offshore energy. This new infrastructure will therefore be an important tool for the academic partners (Ghent University and the University of Leuven), for the Flemish Government (the Flanders Hydraulics Research) as well as for the Flemish industry players who are active in the wider "blue growth" sector, the sector of marine-related activities.